Originally founded in 1896 as The Milwaukee Electric Railway and Light Company, WEC Energy Group (WEC) has grown through six major acquisitions over the past 120 years to become one of the nation’s largest electric and natural gas utilities. The company's last and largest merger, its $9.1 billion purchase of Integrys Energy in 2015, created the largest electric and natural gas utility in the Midwest. 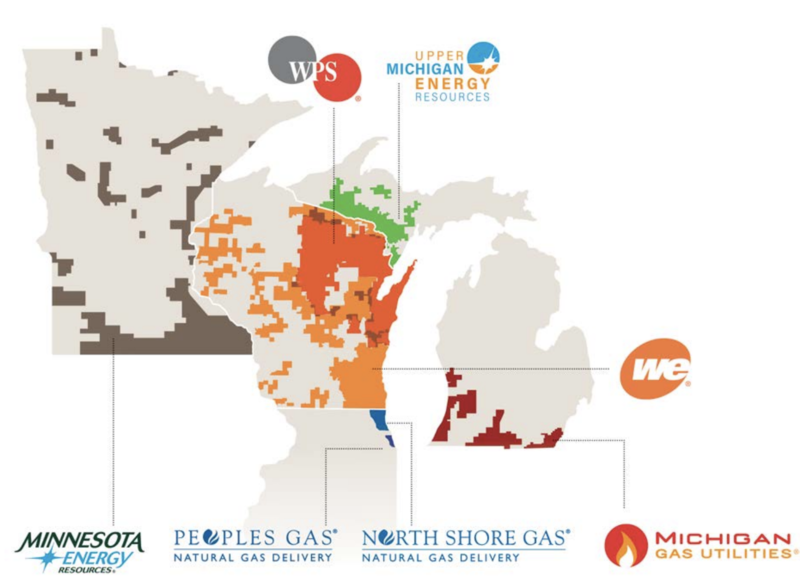 Today WEC provides service to 2.9 million natural gas customers and 1.6 million electric customers located throughout Wisconsin, Minnesota, Michigan, and parts of Illinois. The company also owns 60% of American Transmission Company, an electric transmission company, and has a nonregulated renewable energy business. However, over 99% of its earnings are from regulated activities, and the company's home market of Wisconsin still accounts for the vast majority of WEC's business. 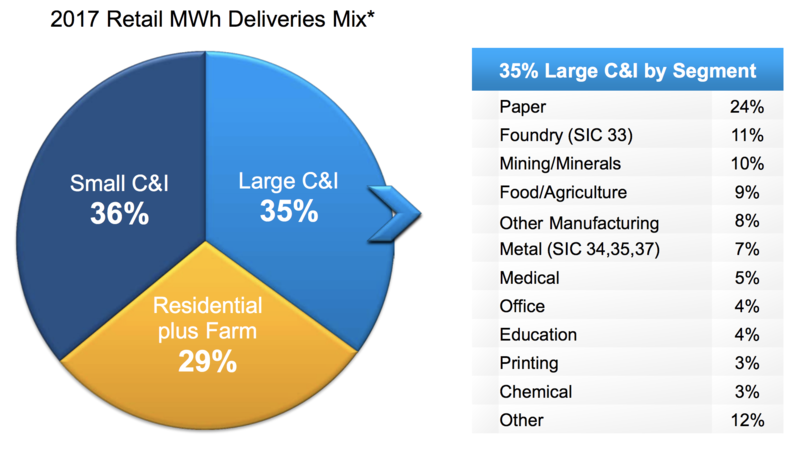 As you can see, WEC also maintains a balanced sales mix, serving a variety of residential, commercial, and industrial customers. Regulated utilities are usually some of the most dependable businesses in the country. They have minimal competition in the regions they operate in, enjoy guaranteed rates of return on their capital investments, and provide essential services. WEC is particularly impressive from a reliability perspective because it is the only regulated utility to beat guidance every year for more than a decade. The company's track record largely reflects management's discipline and conservatism with how they run the business. For example, WEC's largest utility, WE Energies, was recently named the most reliable utility in America and the best in the Midwest for the seventh year running. WEC also takes a very safe approach when it comes to debt, choosing to maintain healthy leverage ratios. As a result of its conservative financial metrics, all of WEC's utilities maintain "A" credit ratings, and the company does not expect to need to issue any equity going forward, which is unusual for capital-intensive utilities. Besides having a disciplined management team, WEC has long benefited from operating primarily in Wisconsin (69% of its regulated businesses), where the company has enjoyed a constructive regulatory environment and improving demographics. Wisconsin has become increasingly friendlier to businesses in recent years and was actually ranked as the 10th-best U.S. state for business for the first time ever by C.E.O. Magazine in 2017. While retail electric sales are expected to be flat to up slightly over the next five years, largely due to greater energy efficiency and more affordable power, WEC's utilities continue seeing decent customer growth. In fact, its utilities served approximately 11,000 more electric and 20,000 more natural gas customers in 2017 than they did in the prior year. 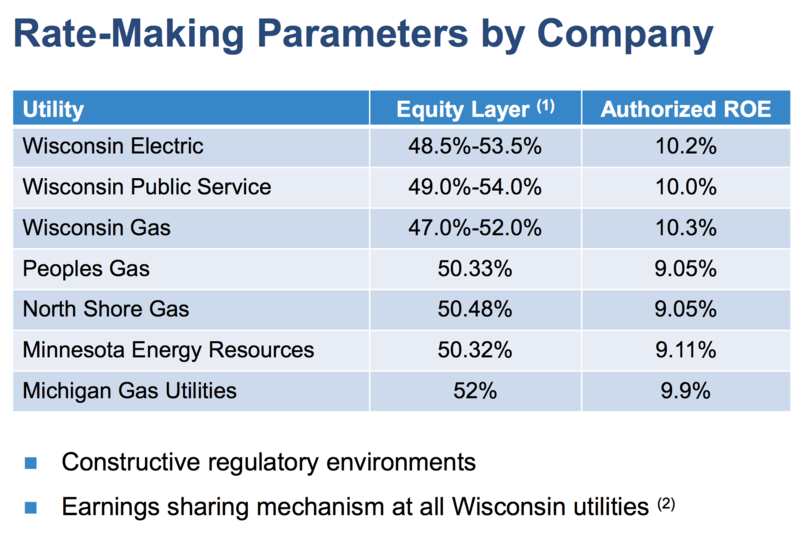 On the regulatory front, you can see that WEC's Wisconsin utilities enjoy solid authorized returns on equity around 10%. WEC also benefits from a unique earnings sharing mechanism in which its customers and shareholders share equally in the first 50 basis points of earnings above the company's allowed rate of return; anything above that level flows completely to the customers. The Wisconsin Public Service Commission most recently approved WEC's proposed rate settlement to keep base rates flat for 2018 and 2019, marking four consecutive years of steady rates and giving WEC and its customers extended price certainty. Outside of an outstanding rate case in Minnesota, where the company has a relatively small presence, WEC doesn't have plans to file traditional rate cases in any of its jurisdictions. In other words, there shouldn't be much regulatory risk over at least the next couple of years, ensuring that WEC has the opportunity to recover its costs and earn a reasonable rate of return on invested capital. Management believes that WEC's "track record of reliability and competitive rates was a factor in the decision by Foxconn Technology Group to invest $10 billion in a high tech manufacturing campus" in Wisconsin. Foxconn is an electronics manufacturer (most notably for Apple's iPhone) and is expected to break ground on its campus in 2018 and eventually employ 13,000 people, providing a nice piece of growth for WEC. 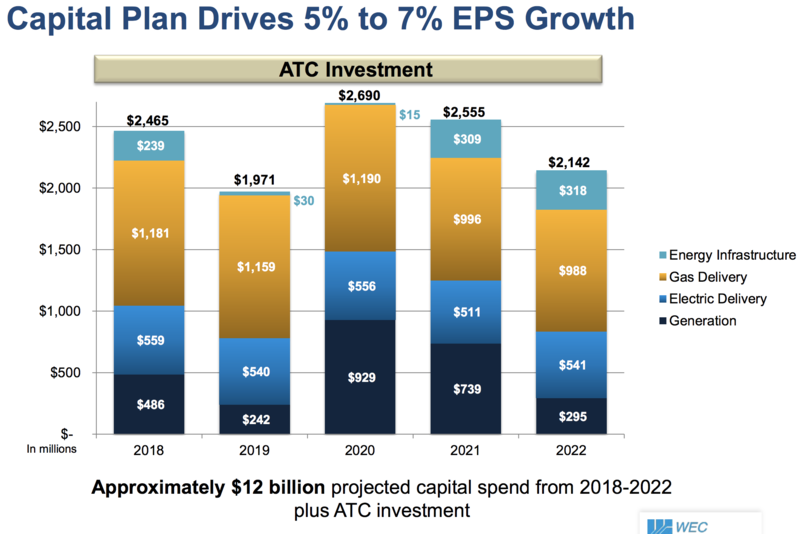 Speaking of growth, WEC's capital spending plan is expected to deliver 5% to 7% annual earnings per share growth over the next five years. Gas delivery is set to receive the largest amount of investment given the number of profitable opportunities there are to invest capital. In Chicago, for example, the natural gas infrastructure is very outdated and requires many years of work ahead to improve its piping. Some of it was installed more than a century ago and is rusting. WEC's reputation for reliability will allow it to work with regulators to continue making progress providing its Chicago customers with a delivery network that is safe, modern, and reliable. In general, low-cost natural gas and continued pipeline development activity have made gas delivery a hot growth area for utilities, and WEC Energy’s business should benefit from this development. 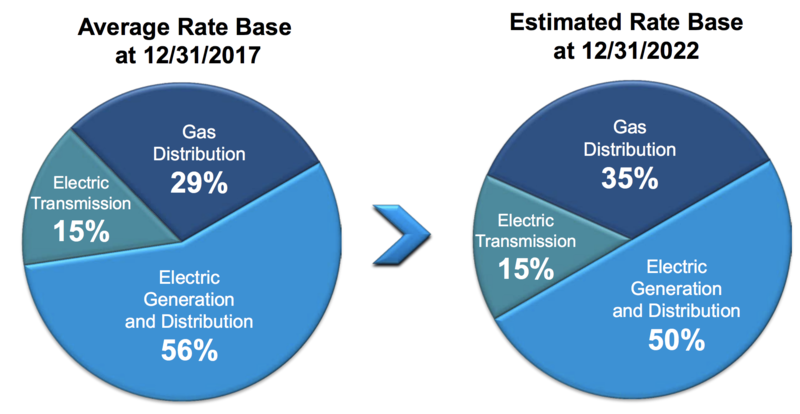 As you can see, WEC expects its rate base to increasingly favor gas distribution over the next five years. Importantly, the company's capital plan is also focused on reshaping WEC's generation fleet for a clean reliable future. WEC is retiring older coal generation units and investing more heavily in natural gas and solar energy to meet customer demand for electricity. Besides reducing costs to customers and diversifying its fuel, WEC aims to reduce its CO2 emissions by approximately 40% below 2005 levels by 2030. Overall, WEC Energy Group appears to be a very well-run utility with a set of premium businesses operating in constructive regulatory environments. As management executes on the company's capital plan over the next five years, the company should be able to continue delivering mid-single digit dividend growth for shareholders. WEC has raised its dividend for 15 consecutive years and remains in great shape to continue that trend. The company's increasing diversification by state jurisdiction and fuel type, solid investment grade credit rating, conservative target payout ratio of 65-70%, and lack of need to raise equity capital are all strengths that should serve the business and its shareholders well. Like all regulated utilities, there are a few important risk factors to keep in mind when considering WEC Energy. First, in a rising interest rate environment, refinancing debt over time is likely to become more expensive. That means a gradually rising cost of debt (and capital) that could increase margin pressure, as well as limit the amount of growth projects WEC Energy can invest in, especially given management’s disciplined approach of refusing to invest into less profitable businesses. Another major risk is political and regulatory in nature. Specifically, WEC Energy initially grew strongly in its home market, where management has had very good relationships with regulators. This is demonstrated by the 9% to 10% returns on equity the utility's subsidiaries are permitted. However, now that the company is expanding aggressively into other regulatory domains, specifically Minnesota and Illinois, management will have to deal with potentially less friendly regulatory regimes. That could be especially true in Chicago, where higher living costs and major budget deficits increase political pressure to keep rates low. For example, in order to get approval for the Integrys Energy acquisition that added a large number of Chicago and Illinois gas customers, management was forced to accept some margin-sapping concessions, including a two-year rate freeze and a commitment to maintain a minimum level of union jobs for at least two years. Going forward, as WEC Energy grows and potentially further diversifies into other states, these kinds of regulatory uncertainties will probably increase further. 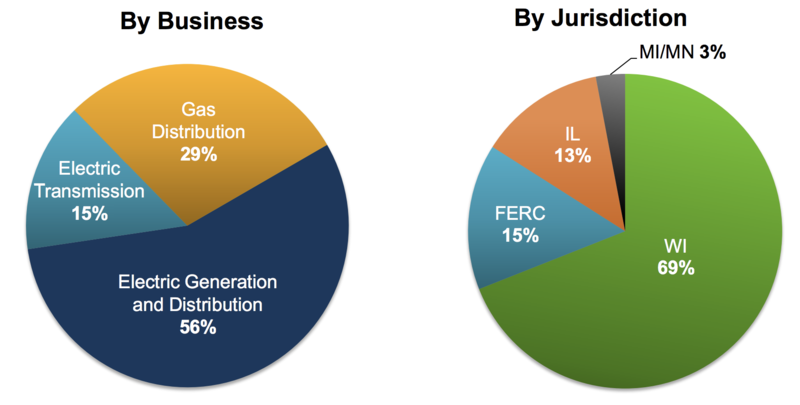 The company’s dependency on coal power (53% of capacity) also results in somewhat heightened regulatory risk. For example, the EPA’s Clean Power Plan, issued in 2015, could result in significant compliance costs (although the Trump administration is trying to repeal the plan). Finally, it's worth mentioning the long-term risk posed by distributed power generation. WEC generates power at at massive central station power plants to achieve economies of scale and produce power at a competitive cost. However, distributed generation technologies that produce power, such as wind turbines and solar cells, have become much more competitive. In fact, utility-scale solar prices have dropped by approximately 70% over the past five years, making solar a cost-effective option for many of WEC's customers. 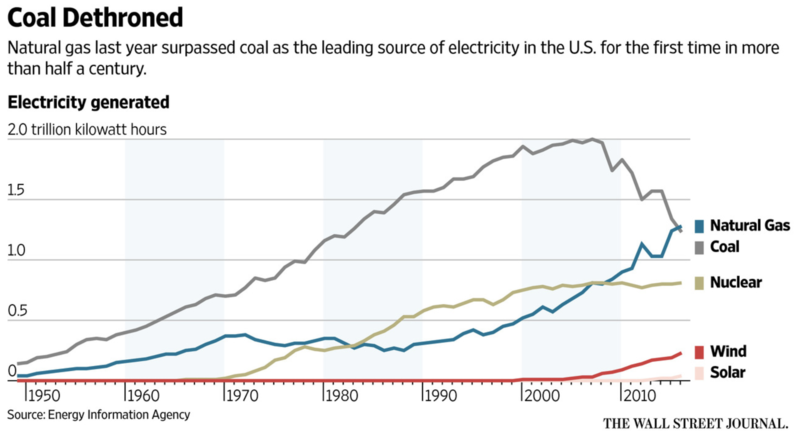 As you can see, coal's share of electricity generated has been plunging while wind and solar are growing quickly. Some analysts estimate that electricity generated from utility-scale solar and wind farms is even cheaper than natural gas today. The good news is that WEC is investing aggressively to balance its energy supply with customer demand. The company is in discussions with developers to tackle a utility-scale (350 megawatt) solar project in Wisconsin that will call for more than $300 million in spending over the first few years and replace one of its old coal plants. As WEC continues building out its renewables portfolio, closes older coal plants, and invests more in gas-fired facilities, it should be positioned relatively well for these trends. Conventional generation sources seem likely to remain a big part of the power picture as well over the long term since solar and wind are less reliable energy producers (cloud days, no wind). While the company is not nearly as well-known as some of its larger cousins, WEC Energy Group appears to be a blue-chip utility stock that should appeal to conservative dividend growth investors. With a very low risk profile, a rock solid payout, and a strong growth runway in predictable regulated businesses, WEC Energy is a stock that should provide dependable, rising dividend income for many years to come.